Nico Rosberg finally put a smile on the face of everyone at Mercedes as he piled on the laps at Jerez while it was also a first run-out for Red Bull’s Sebastian Vettel. Rosberg was halted by an electrical fault on the opening day of pre-season testing on Tuesday while team-mate Lewis Hamilton crashed out on Wednesday following brake failure. The pressure was on the team to emerge unscathed on Thursday and they were relieved to report a clean bill of health after Rosberg completed 148 laps – the equivalent of two grands prix distances. “We were just massively unlucky the last two days with problems that could have been easily avoided, but they’ve also been so difficult to fix, which is also very unusual,” said Rosberg. “But today [Thursday] we showed we have a very reliable car. We really made up for it. Nothing at all went wrong, not the slightest thing, which is good. “It really put a smile on everybody’s face. “To drive from Silverstone to Spa, distance-wise, in a test day with an F1 car with no problems whatsoever, pounding out the laps, being very consistent, is a fantastic achievement. “So I’m very excited about today because it was a great test day as we were consistent and we got through everything we had on the plan.” Hamilton, who returns to the car on Friday to conclude the first of three tests before the season kicks off in Australia on March 17, will be hoping for a repeat of Rosberg’s reliability. “I’m sure it’s going to be the same tomorrow,” Rosberg added. “That will really kickstart our programme.” The 27-year-old finished second on Thursday with a best lap of one minute 18.766 seconds, sandwiched between the pacesetting Ferrari of Felipe Massa and reigning three-time world champion Sebastian Vettel, making his first outing in the new Red Bull. Jenson Button, who was quickest for McLaren on Tuesday, was down in seventh but only because he concentrated on aero and mechanical work. The Briton’s day ended five minutes early after he stopped the MP4-28 on track, apparently due to a loose wheel following a pit stop. Massa, meanwhile, was happy to finish top of the standings with the fastest lap of the week so far – a 1:17.879. His fastest lap came on the quicker soft tyre, and the Brazilian is refusing to get carried away. “It was an important three days for us to find the right direction to work on the car, even if I didn’t do as many laps as I expected to do,” said Massa. Sergio Perez savoured “an incredible day” as he made his track debut for McLaren in a car he can already tell has race-winning potential. 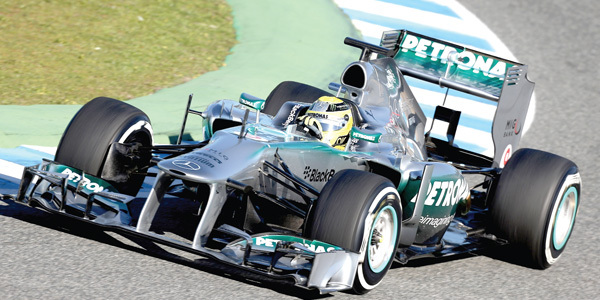 Although only seventh quickest at the Circuito de Jerez, Perez enjoyed a steady introduction to his new car after two seasons with Sauber. Perez had his moments with the Swiss-based team, notably last season when he finished runner-up twice in Malaysia and Italy. But primarily the Sauber was a midfield runner, so to get behind the wheel of a car that could land him a maiden victory was an obvious thrill. There remain a few kinks to iron out, such as being more comfortable in his race seat, but aside from that the 23-year-old Mexican could not be happier. “It was a day in my new office which was much more different than I was expecting,” said Perez. “By sitting in a different seat you have to adapt yourself to a new position, a different way of holding the steering wheel. Pretty much everything is different”.